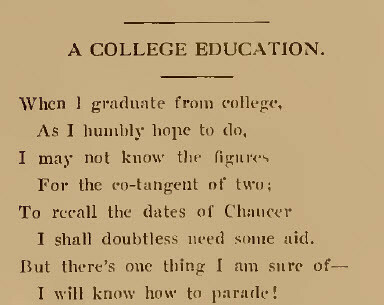 A rhyme from the Wellesley News, the student newspaper of Wellesley College, from the late 1910s. So this rhyme was published in the section of the Wellesley News called the "Parliament of Fools"--which is where they often ran jokes, rhymes, and even cartoons. I found this rhyme amusing in that it seems that some things never change. I'm asusming that "parade" is a reference to partying of some sort or just being seen in public (e.g. parading about town"?). We often hear students lament or claim the same thing about college--they learned very little except how to party. So it's clearly something that has been heralded for many generations, which in some ways, makes me feel less worried or concerned about it as an issue as I might otherwise be.